If there’s one thing my friends and I know how to do, it’s how to throw a fabulous party. With creative décor and thoughtful details, my friends and I have been known to transform ordinary spaces into DIY party planning bliss. With us, there’s no such thing as a run-of-the-mill barbecue or a simple kids party. I’m talking DIY party planning, enticing invitations, dessert bake-offs, costumes, photo booths, award ceremonies, seven-layer homemade cakes, photo props, and the most creative decorations you could imagine. 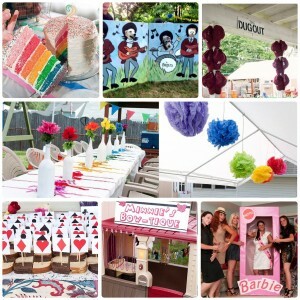 An Awesome Theme – Every party needs a fabulous theme. It’s easy to pick the theme for a kids party because you can use your children’s interests – whether it be Minecraft, Legos, Sesame Street, Mickey Mouse, or Frozen. 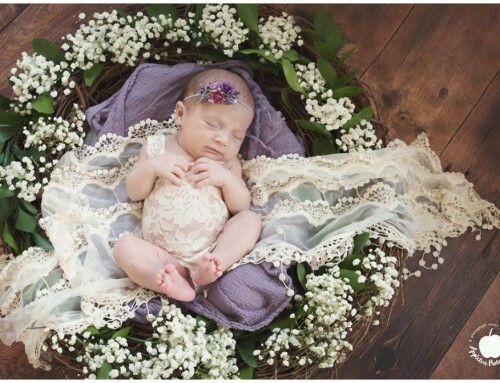 Thinking outside of the box, my friend Heather loves to use ideas that are less trendy but completely awesome. She’s thrown an adorable You are my Sunshine first birthday, an All-Star Sports birthday, and a Color Splash Birthday Bash, just to name a few. 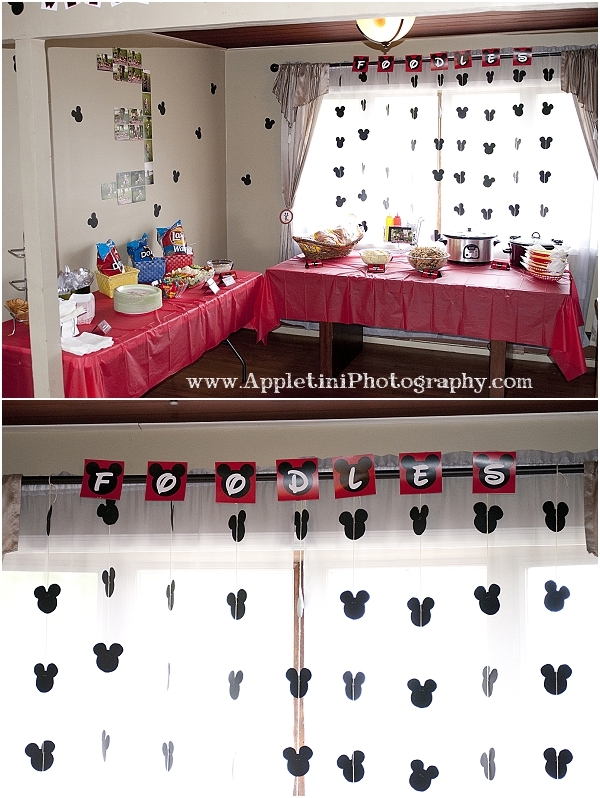 Aside from kids’ birthdays, it’s easy to forget that other parties need a terrific theme too. Not only do themes provide direction in the party planning, as all of the decorations and details stem from this, but themes are also what make parties so fun! Some of the theme parties my friends and I have had are an Alice in Wonderland Bridal Shower (Lissa in Loverland), a Barbie Beach Bachelorette, a Breakfast at Tiffany’s Bridal Shower, a Beatles “When I’m 64” birthday, a Cowgirl Ranch Bachelorette, a Bad-to-the-Bone 60th, and an Airplanes and Pinwheels Baby Shower. 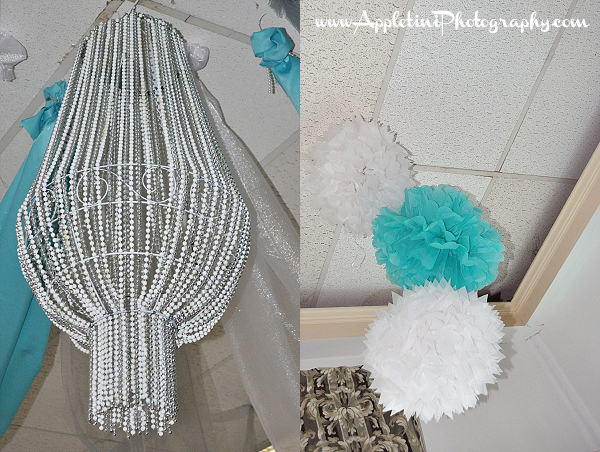 The details above are from the Alice in Wonderland party. All of these thoughtful details were truly amazing, as the party was wonderland paradise. Not to mention, we dressed in costume too 🙂 When DIY party planning, start with a theme. In choosing a theme, think about the person’s or couple’s interests. For Christine’s shower, we chose the Barbie Beach theme because she still has Barbies in their boxes from the 1980s. For Melissa’s Bachelorette, we chose a Cowgirl Ranch theme because Melissa is a laid-back, relaxed type of gal, who loves a pair of cowboy boots. Eileen chose a Beatles “When I’m 64” theme because of her dad’s love for the band, and with her dad turning 64, the song title couldn’t have been more fitting. Other ideas include a play off of the honoree’s name, like my Breakfast at Tiffany’s shower. You could also incorporate a nearby holiday into the party’s theme, like how we incorporated Halloween into our Bad-to-the-Bone birthday bash. Festive Decorations – When you use a creative theme, you are opening the door to endless DIY party planning and decorating possibilities – way beyond crepe paper, balloons, and one-size-fits-all party signs. With the Internet at our fingertips, it’s easy to see others’ awesome ideas and to create your own spin on what’s already out there. I loved the decorations at the Color Splash Birthday Bash. We had everything was organized in true ROY G. BIV fashion. Heather spray painted wine bottles for centerpieces, made colorful pom-poms, and even used free paint chips as decorations. 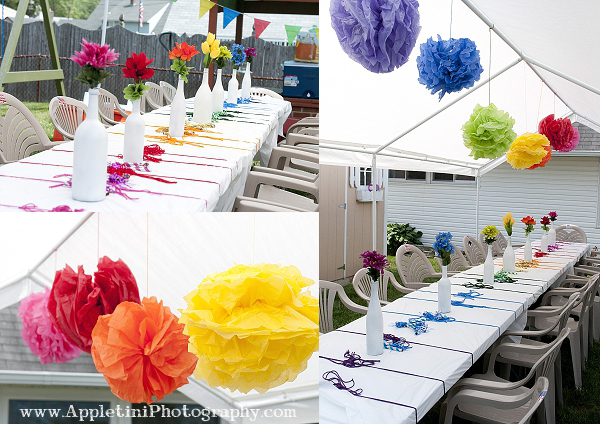 The decorations went perfectly with the party’s rainbow theme, and the bright colors looked fabulous. Another favorite of mine was the All-Star Sports Party. With the infamous football field tablecloth, the cardboard pennant banners (Heather loves herself some cardboard! 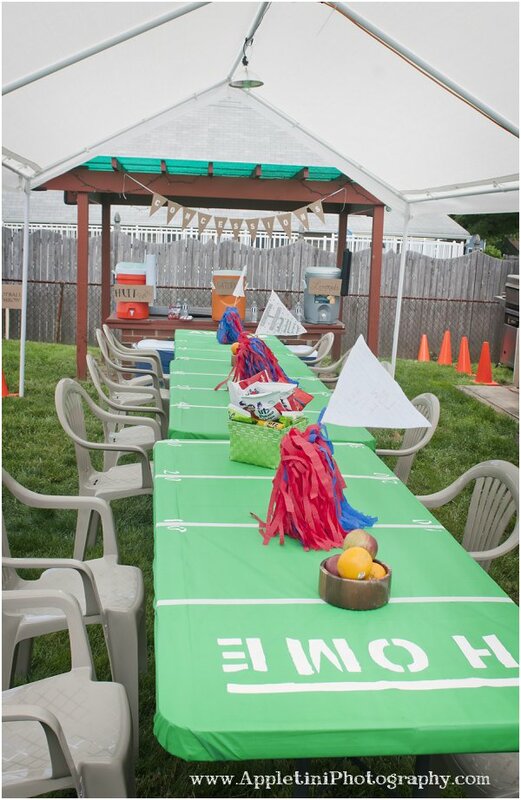 ), and the cheer pom-poms as centerpieces, the whole backyard was transformed into a terrific sports arena. It truly wowed her guests! Call me biased, but my favorite hands down, was how my friends changed this ordinary party space into my Breakfast at Tiffany’s Bridal Shower. Simply amazing, right?! I couldn’t get over all of the perfect details – from the centerpieces to the place settings to the amazing homemade chandelier (tutorial is here). 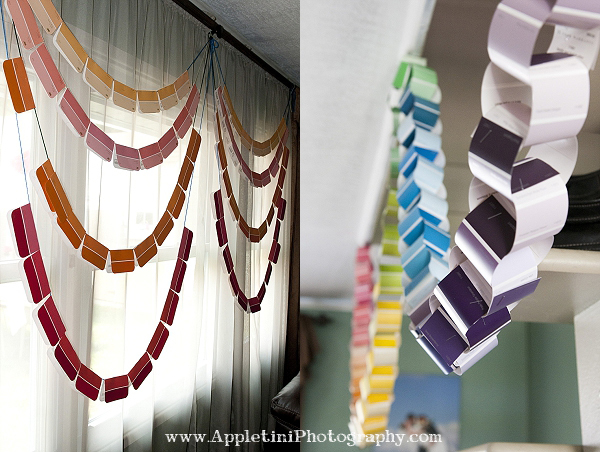 This is DIY party planning at its finest. Although the theme will be your guide when it comes to some decorations (like fancy chandeliers), you can tailor other decorations to the theme of the party. In the above photos, you can see that rainbow-colored pom-poms were used at the Color Splash and turquoise/white ones were used at the Breakfast at Tiffany’s Party. Although they are essentially the same decoration, the color choices were different and each combination perfectly suited the theme. 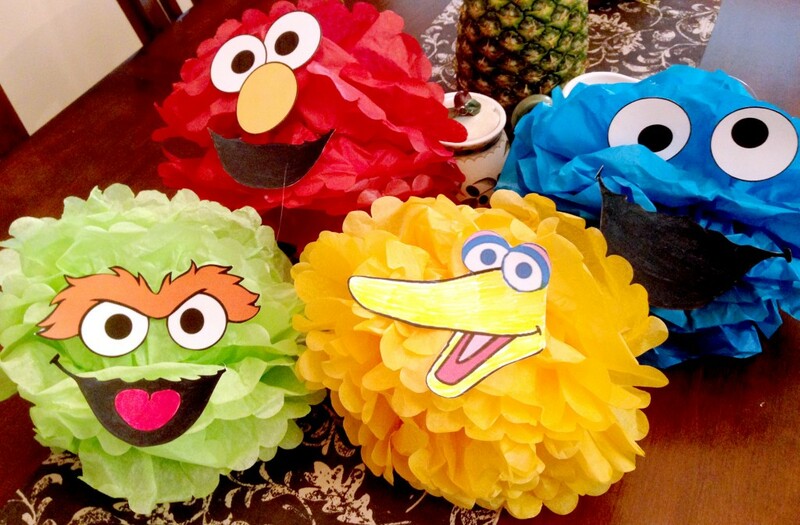 You could also get even more creative with pom-poms and turn them into characters, like Eileen did for her son’s Sesame Street party (tutorial is here). A decoration that always looks beautiful, no matter the theme, are lights strung through tents, like at this Crab Boil Bridal Shower we threw our friends. 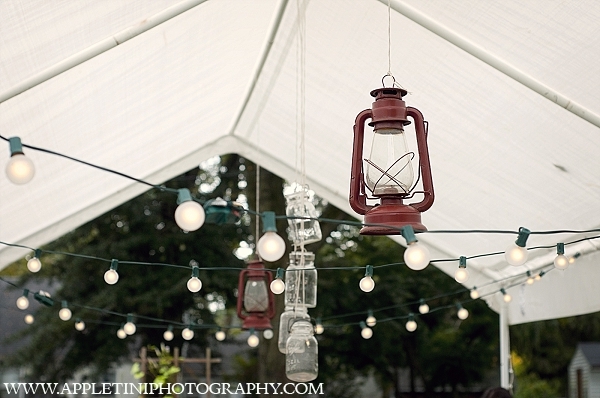 With the lanterns, we added a splash of red to go with the rustic yet elegant red, white, and blue colors. And, what party would be complete without a photo display? 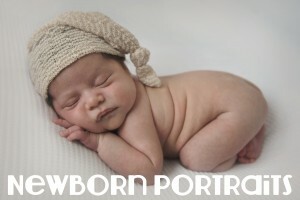 Shaping photos into the age of the birthday girl or boy is a popular way to display photos of the past year. 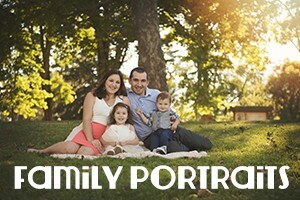 My friends and clients love to use the complimentary 4×6 prints from their yearly photography session. 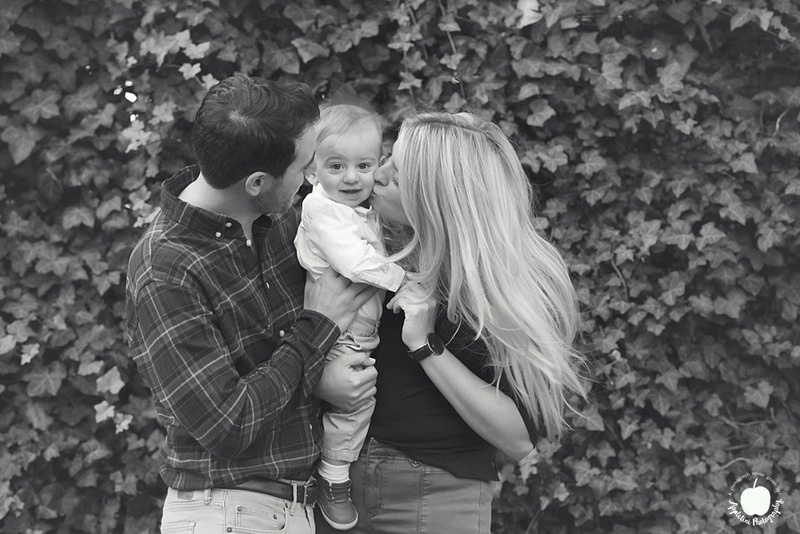 Some of my clients like to have a photography session before the big party, so they can display their photos from this recent session for all of their guests to see. When decorating with a fabulous theme, the possibilities are truly endless. Start with the theme to determine your color palette and serve as your decoration guide. From there, use your resources to help decide on the decorations – whether it be bouncing ideas off of your friends, or spending time with everyone’s favorite party planner – Pinterest. With Pinterest being an easily accessible index of party ideas and DIY creations, this wonderful resource can be the springboard for the best decorating ideas. Creative Spread – First and foremost, people love to eat, especially at parties, so the food has to be delicious and abundant. You also want your guests to be pleased with the food choices. Any vegetarians, peanut allergies, gluten intolerances? Once you’ve got that covered, everyone always appreciates a creative spread. At the Mickey Mouse Clubhouse birthday, the food was adorably named after characters. On the menu was Hot Diggity Dogs, Chips and Dale, Donald’s Cheese & Quackers, and Toodles’ Noodles. There was also a sign above the food that read “Foodles.” Not only was the food creatively named, but the labels also were made in true clubhouse decor – a red background with Mickey ears. Another party where the food perfectly complimented the theme of the party was the fabulous Sock Hop/50s Diner party that Heather threw her mom Joanie. 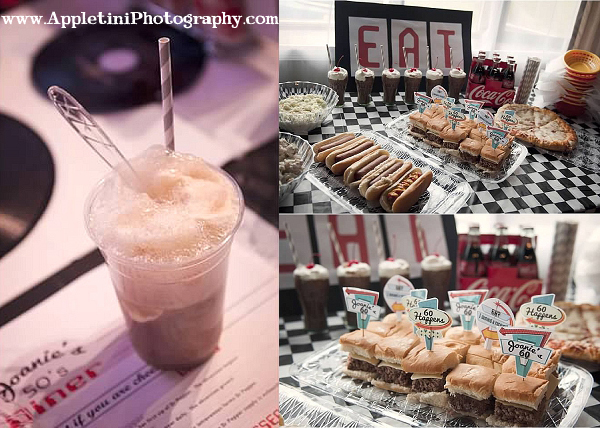 They had an amazing spread, using retro signs in the sliders, which read “Joanie’s Diner,” a wonderful rendition of the 1950s soda pop, and a full-out retro diner menu. One party menu that always has me laughing is the Beatles spread where all of the food (right down to the drinks) was named after Beatles songs. 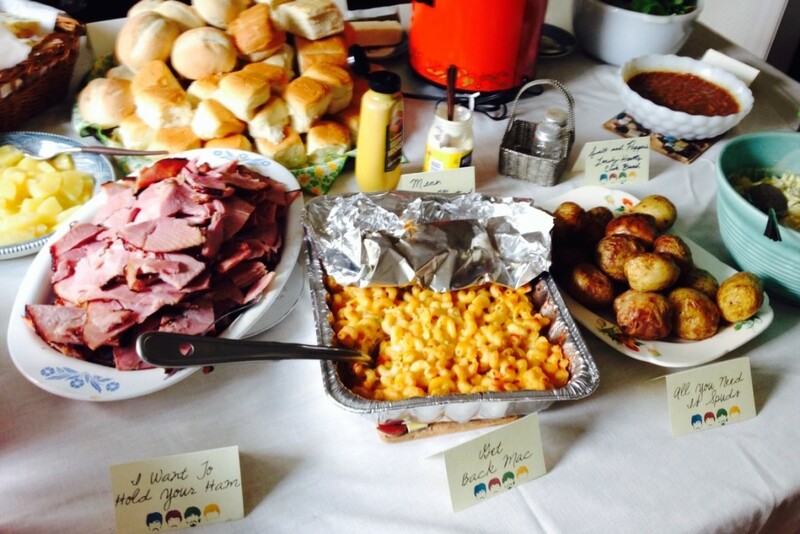 The grilled ham was called “I want to hold your ham,” the mac and cheese was “Get Back Mac,” the rolls were “Here comes the bun.” (For a full list, click here).Each of the food stations (Appetizers, Lunch, Dessert, and Beverages) was also named after song titles. For example, above the lunch table was the sign “Can’t Buy Me Lunch.” Guests were truly awed by the creativity here. If you choose to creatively name your food, a good idea is to have a brainstorm session with your partner or friends. 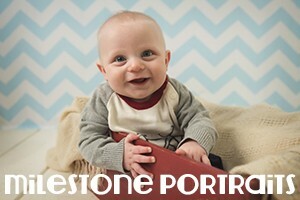 Not only will you come up with some awesome names, but you’ll certainly be sharing some laughs. In addition to naming food after characters or songs, you could also arrange your food to go with the theme. 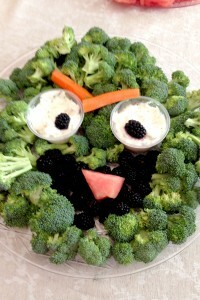 Here is an Oscar veggie platter that was served at the Sesame Street party. Big Bird and Elmo appetizer platters were also arranged. At the Color Splash, the food was arranged just how the decorations were arranged, in true rainbow order. 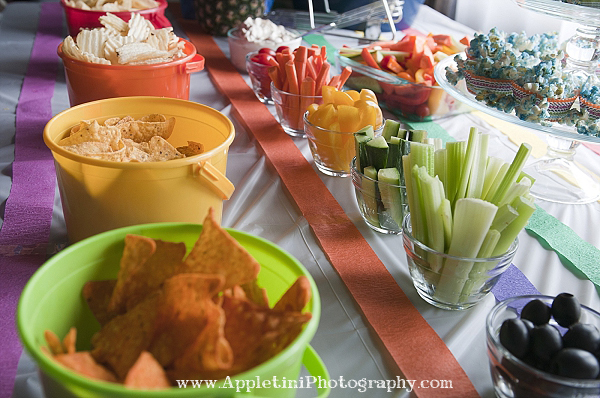 There weren’t any fancy labels, nor were any needed, so this colorful spread was perfect. 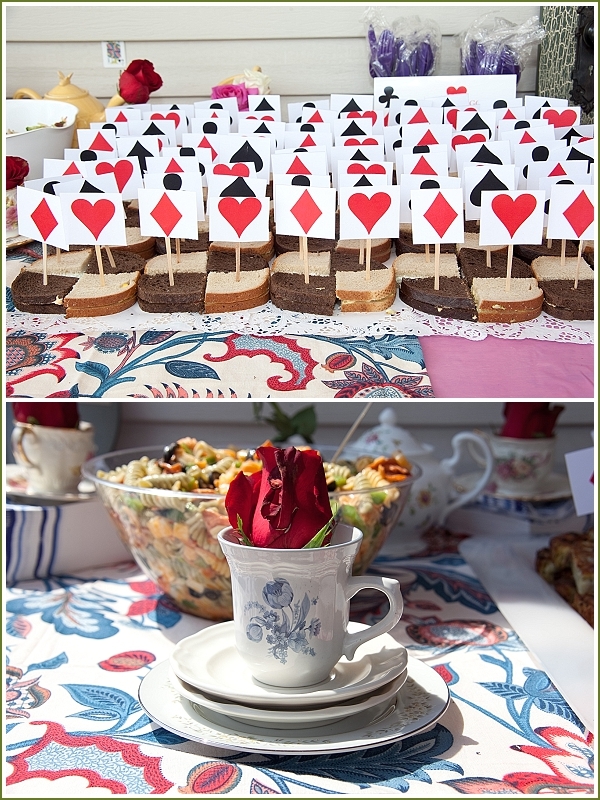 And, just sometimes the theme of your party provides a menu in itself, such as at the Alice in Wonderland tea party. There were tea sandwiches and tea cookies galore, along with cute character quotes, doilies, and tea settings, providing even more of an amazing wonderland atmosphere. Extending your theme to your food or its arrangement definitely takes your party up to the next level! It adds such a wow factor, showing you’ve thought of every detail. Especially the detail that guests love – the food! Not only is incorporating the food into the theme of the party easy and fun, but it has a lasting impact. I don’t think anyone is going to be soon forgetting the Oscar veggie platter, the tea sandwiches and cookies, or the cute sliders from Joanie’s Diner. Dessert that Wows – Save the best for last is a saying that must have been coined by a dessert-lover. Truly, the dessert at a party is what everyone is always waiting for. Tying the dessert into your party’s theme is another way to wow your guests. With all of the dessert and decorating ideas out there – tiered cakes, cake pops, pull-apart cupcakes, and fondant – you can be as creative as you would like when it comes to your dessert. 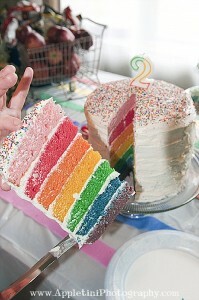 For the Color Splash Birthday Bash, Heather made this seven-layer rainbow cake with vanilla icing from scratch! She used three cake boxes and seven different containers to create the batter. It was a little tricky and definitely time-consuming, yet it was all worth it for a beyond perfect cake. It was the highlight of the rainbow birthday bash. Even though her friends and family knew how creative she was, this cake still blew them away (step-by-step rainbow cake tutorial). 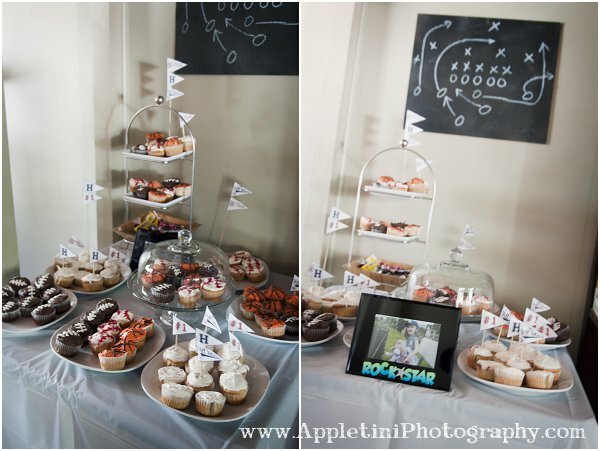 For the All-Sports Star Birthday, an adorable assortment of cupcakes were decorated as footballs, basketballs, and baseballs with pennant flags as cupcake toppers. The cupcakes were arranged using tiered cupcakes stands, cake plates, and various other plates. With a framed picture of the birthday girl in the middle, the spread was beautiful. With its deliciousness and creativity, the sports cupcakes definitely impressed all of the guests. Tiered cupcake stands and cake plates are a wonderful way to display your cupcakes and cookies. They add a certain elegance to the desserts you worked so hard to make. At the Sesame party, Eileen made awesome Elmo and Cookie Monster cupcakes. The secret? Decorate with sprinkles 🙂 They looked adorable, as did the Elmo cake. She made a two-layer, gluten-free cake, decorated with red sprinkles and chocolate icing with an Elmo face on the side. 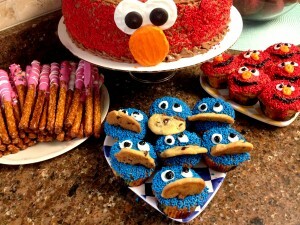 The Elmo face was made from cookies (cupcake and cake tutorials are here). Not only did she have themed cake and cupcakes but Eileen also had pretzel sticks dipped in pink candy melts to replicate Abby’s magical wand. The kids loved all of the desserts – they were such a delicious treat. At her husband’s graduation party, Heather made an array of cute cupcake toppers. 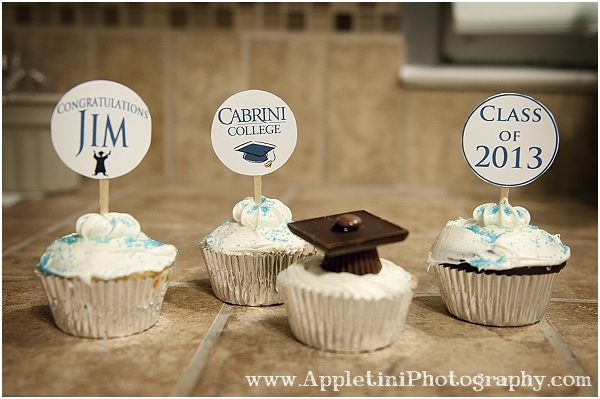 She made adorable graduation hat cake toppers from chocolate candies and a variety of homemade signs. The graduation cupcakes were the perfect touch after a wonderful congratulatory meal. Cupcakes are a great dessert because you can make and decorate them in a variety of ways. Heather made two kinds of cupcakes (vanilla cake and chocolate cake) and then decorated them in two ways – the graduation hat topper and the signs. With one dessert, she had four different varieties. You can also make a batch of vanilla cupcakes and swirl cinnamon and sugar into a few cups, chocolate chips in other cups, and blueberries in a few other cups – along with keeping some vanilla. Now you have four different cupcakes within one batch. Ice half of them chocolate and half of them vanilla, and now you have 8 varieties. Party guests love having different dessert choices, as it’s more delicious and decadent. Making homemade desserts is a lot of work, and you can’t really do it too far ahead of time, so it usually results in a long day or night before a big party. However, each of my friends who put the time into these awesome desserts would do it again in a heartbeat. There is something special about making a beautiful themed cake or cupcakes from scratch. All of your guests are completely wowed at both the level of skill it took and how wonderful it tastes. If you don’t think you can handle a homemade cake or cupcakes, it’s totally okay to use a bakery or cake lady. You still will have a lot of fun planning exactly what you would like the cake to look like, and the results can be pretty phenomenal. There’s so much fun to be had when planning and making desserts. You can let your creativity go wild with all of the ideas that are out there. It’s another way to incorporate the theme of your party in a way that completely impresses your guests. Great Activities or Games – Every party has to have some sort of entertainment, even if it’s a simple activity or two. 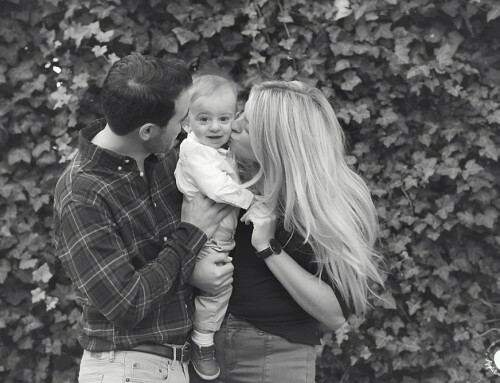 Not only do games and activities both provide learning and social opportunities for children, but they entertain adults, livening up the party. Games break the ice, make people laugh, and are another way to show off your party planning skills! 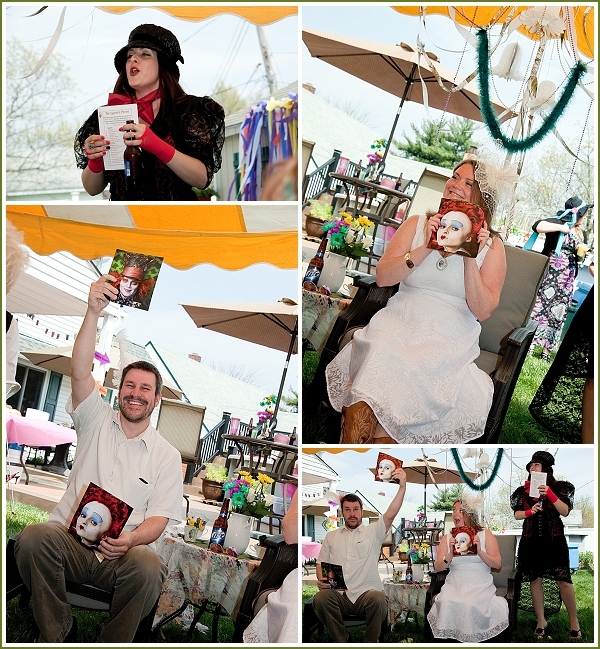 At the Alice in Wonderland Bridal Shower, we gave the bride and groom questions like “Who does the dishes? Who does your cat love more?” If they chose the groom as the answer, they were to hold up the Mad Hatter picture they were given. If they chose the bride as the answer, they were to hold up the Queen of Hearts. The guests played along too and had a ball! At the Fairy First Birthday, all of the party guests were greeted at the transformation station – a magical place, where the little girls dressed as fairies and the little boys dressed as gnomes. Among the props were sweet hairpieces, beautiful wings, and lots of tutus for the girls, along with little hats and silly beards for the boys. 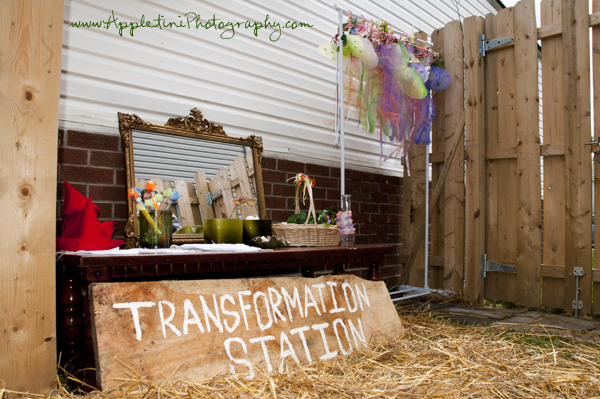 The boys and girls loved being in costume for the party.The transformation station was a rustic little cove, with a beautiful mirror, a filled wardrobe, and a hay floor. It set the scene for the fairy party and was a wonderful activity that started a magical afternoon. The most fun shower game that I’ve been a part of was at my bridal shower. 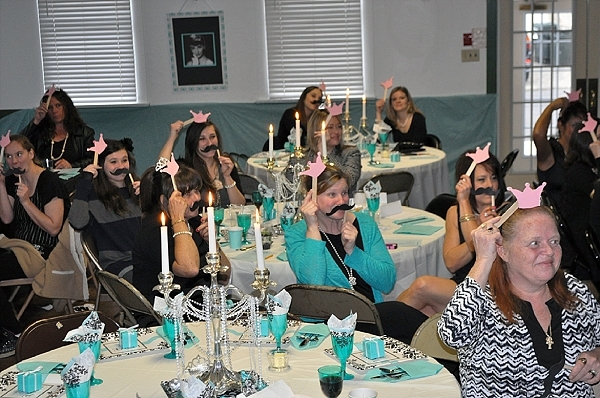 My friends organized a game called Mustaches and Tiaras. The bride and groom were asked questions ahead of time, such as “What is your idea of a perfect date?”At the shower, one of the responses was read (either the bride’s or the groom’s). Guests were to guess whether it was the bride’s or the groom’s answer, by holding up their tiara for the bride or their mustache for the groom. It was such an entertaining game – the whole room was in hysterics. At the Sesame party, different stations were set up for the toddlers to play with. 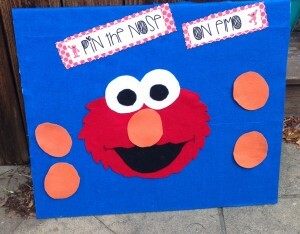 There was a Pin-the-Nose on Elmo – made of felt, Cookie Monster’s Cookie Toss – made of cardboard and felt bean bags, Super Grover’s Super Obstacle Course – made with pool noodles, and Hopping with Zoe – a homemade hopscotch mat made entirely from felt. Children were able to walk up to the station-like games with their parents and take part in the activity. Parents and children loved the games as they were perfectly age-appropriate, fun to partake in, and quite creative. When thinking about games, think about your audience. For kids’ birthdays, think about the age of the children, what they can do, and what they would enjoy doing. For bridal showers, think about the crowd. Do most people know each other? Or would an ice-breaker type of game be a good choice? Is it a more serious crowd? A silly crowd? An older crowd? Tailor your games and activities accordingly. If you are planning a shower with a lot of older women, then a Mad Libs game might not be a good choice. I love the Mustaches and Tiaras game because it’s perfect for all audiences! You want your party guests to feel comfortable but also to have fun. Great games are ones that carry your creativity and entertain your guests, jazzing up the party. Remember games aren’t just for children, but when planning be sure to keep your audience in mind. Thoughtful Details – In addition to the theme, decorations, food, and games, a fabulous party always has a few extra thoughtful details. These details could be an amazing invitation, thoughtful party favors, or special entertainment. They show that you went above and beyond with your party planning, leaving your guests totally impressed. Invitations are a wonderful way to showcase the thought you’re putting into the party. Being that the invitation is the first touch, this lays the foundation for all of the fabulous details that are to come. My friends are known for their fabulous invitations. Above is the invitation that we used for our friend’s Cowgirl Ranch Bachelorette party. 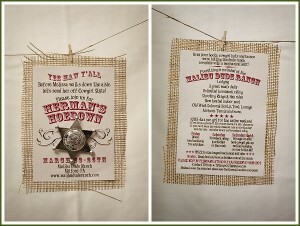 Created in true cowgirl style, the invitation was printed on card stock and glued to burlap. This gave the invite a country feel, which was perfect for the dude ranch we were going to. In addition to all of the fun details on the invitation, it also included a sheriff’s badge. Pretty cool, right?! 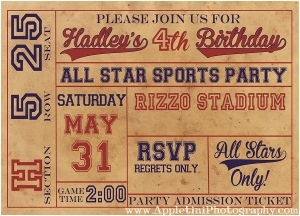 Another awesome invitation was for the All-Star Sports Party. The invitation was made to look like a sports ticket, as all of the details that were included were in sports ticket fashion.One of the things that makes both of these invitations fun and authentic was the creative fonts that were used. With our friends, it’s never Arial or Times New Roman! Each of the invitations uses a number of interesting fonts which are fun and complimentary of each other (there are tons of great websites for this such as Dafont), adding to the authenticity of it. Also, at the All-Star party were party favors that were loved by all. 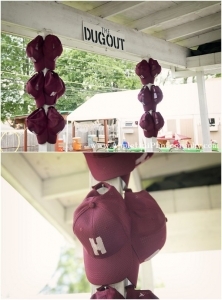 Each child got a baseball cap with an “H” for Hadley, the birthday girl ,stenciled on it. The generous favors were adorably displayed in “The Dugout,” and the kids were so excited that they got to keep them. Another sweet detail was Minnie’s Bow-Tique at the Mickey Mouse Clubhouse party. 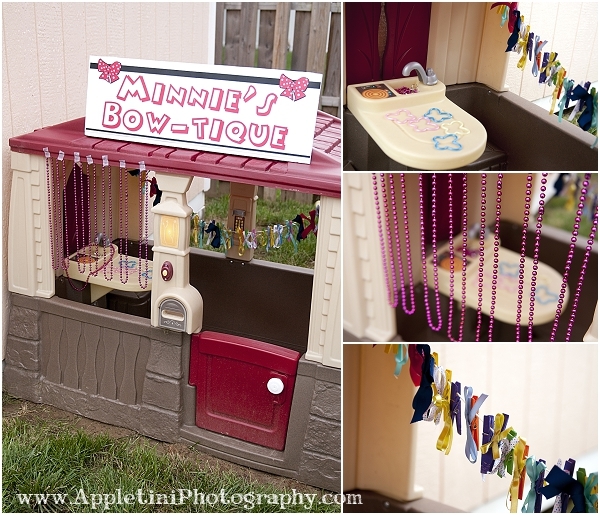 The kids’ backyard playhouse was turned into a cute little “store” that offered bows, bracelets, rings, and necklaces to all the mouseketeers. 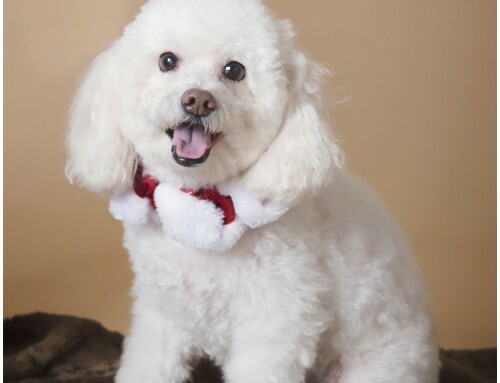 It was a wonderful play on words, as well as an adorable activity for Minnie fans. The playhouse was decorated beautifully, displaying all of the fun jewelry for the mousketeers to wear. The girls were squealing in delight as the played dress-up at Minnie’s Bow-Tique. 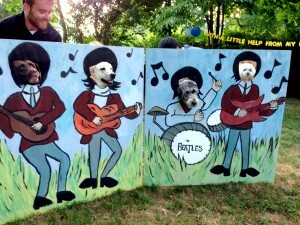 At the Beatles party, they had this amazing Beatles face-hole cutout. Eileen’s sister painted each the Beatles on a 4 x 8 sheet of wood (that was cut in half and hinged together for storage reasons). 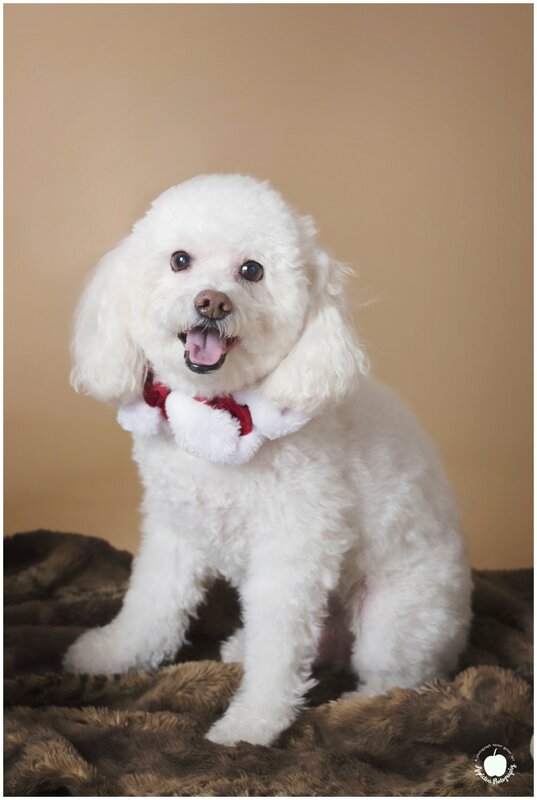 Guests of all ages loved it – even the party dogs! 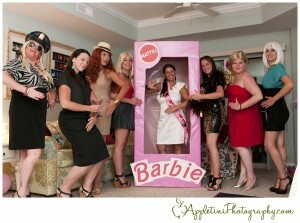 At Christine’s Barbie Beach Bachelorette, we created a life-size Barbie box and took turns posing in it. It was our own spin on a photo booth. It looked amazing, entertained us for hours, and was just the perfect touch to an incredible Barbie bash. All of these extra thoughtful details make your party that much more special. They bring in more fun and excitement, while awing your guests. 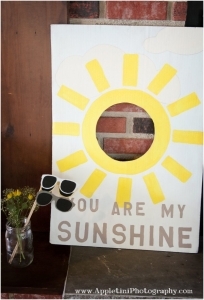 In addition to the ideas above, you could do a photo booth with silly props (check out my friend’s free photo booth app). Everyone loves a photo booth! You could also do a themed pinata, which are an easy, fun DIY activity. There are so many ideas out there. Choose one or two that work for you! When planning parties, my friends definitely do it best. They are the definition of above and beyond! Every party they plan is truly awe-inspiring, and each one tops the one before. Now that our secrets are out, your parties can be just as fabulous! Remember, it all starts with an awesome theme. Your friends and Pinterest can help you with the rest. 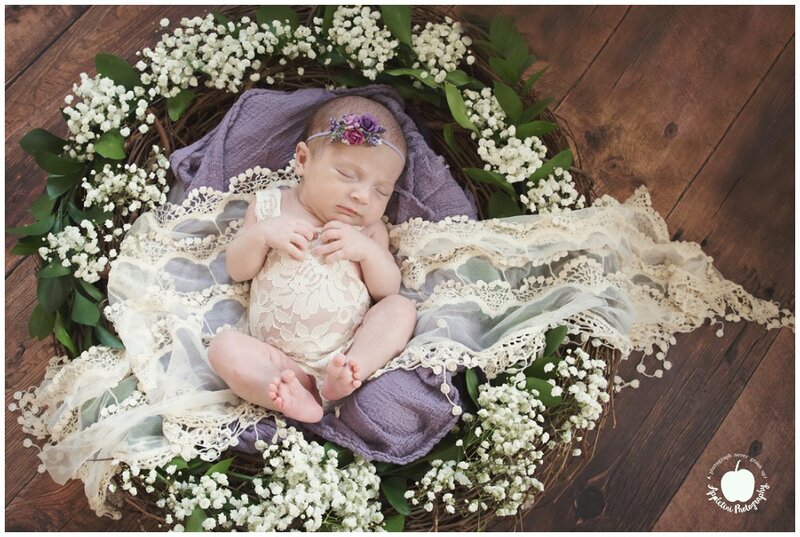 You are welcome to read through our party planning pages and borrow any of our ideas. 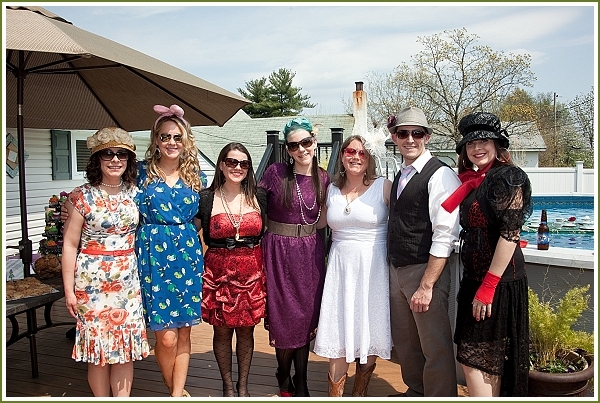 Let us know just how fabulous your party turns out!